Good morning lovely readers. I want to tell you about the dinner we had last night. Previously, if I heard the words Chicken Pie I would just nod and smile and think maybe one day when I have all the time in the world. Isn't it fiddly? Doesn't it take ages? Surely the pastry will be a disaster? Not with this recipe. This recipe meets all my have-a-Little Girl cooking criteria: it's quick, it's easy, it can be made with ingredients you're likely to have, and if you don't, you can substitute. I found the original recipe at the fabulous Sarie website, where it is a red hot favourite. First of all, it uses leftover chicken. Isn't it lovely to have a recipe up your sleeve to use up any leftover chicken, that isn't a sandwich? Don't have any leftover chicken? Neither did I, so I defrosted a couple of chicken breasts from the stash in the freezer. Really want to make your own pastry, but don't have time/energy/confidence? Do what I did, and grab some pastry you have hidden away in the freezer for times like these. I always try to have some on hand. You can use it for anything and everything, and it hardly takes up any space at all. A cooking secret weapon. I had half a bag of mushrooms in the fridge, which I added, together with a glass of the Fabulous Man's open bottle of white wine. If you have any green vegetables that's not enough for a proper side, add this as well. Basically, go to your fridge, see what's lurking, and put it in this pie. The more the merrier. And you know what? It tastes fantastic too. Fancy and comforting at the same time, it's perfect for both Tuesday dinner and Sunday lunch with the in-laws. If you're using raw chicken breasts, chop them, and brown in some olive oil. Remove from pan and keep separate. If you're using leftovers, remove from bone, chop, and keep separate. Heat butter in the same frying pan until frothy, add mushrooms and garlic, and fry until golden. I like to keep the garlic cloves whole, and get a surprising soft, creamy mouthful when I eat. If you think that's weird, by all means chop your garlic. Return the chicken and any juices to the pan, add the white wine and parsley, and cook until the juices reduce. Remember to scrape the bottom of the pan to get all the lovely brown bits. Peel and chop the potato, place with chicken in a mixing bowl. Add the cream, season, and mix everything until just combined. Put the pastry on a baking sheet on some parchment paper, and brush with egg. Pile your chicken filling in the middle of the pastry, leaving a border of about 5 cm. Fold the border over the sides of the filling, and brush this with egg as well. Bake in the oven until golden brown and the pastry cooked, about 35-45min. Serve with a salad and green vegetables. Frozen pastry is a must in my house. Who has the time unless it's for something very special. 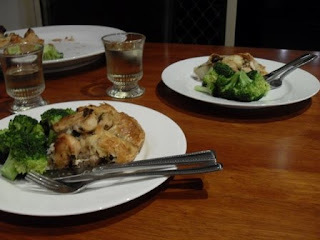 Chicken pie is a great family meal. Hope you are having fun with your in-laws. 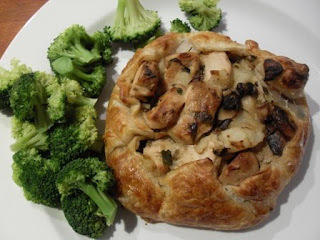 That looks awesome, like a savory galette. What an interesting way to present the ubiquitous chicken pot pie! P.S. Do they still have Fair Lady and Femina in SA? I grew up reading them (yes I was an 80 year old nanny stuck in a teen's body)!! Heather, I'm a lucky girl. My in-laws are absolutely lovely. No mother-in-law jokes from me. Ann, I'm not really sure what's what in the South African magazine world, I'm in Australia now. But I'm actually visiting there for the next couple of weeks and want to see if I want to subscribe to some of them. Can't wait. Jeanne, I know exactly which chicken bake you mean. I have a shortcut to it on my desktop in the to-make corner. Looks delicious.